"I had been looking for ten years to find a violin that would suit my varying activities, before I found Christoph's instrument. His violin has not only got volume and carrying power but has this combined with a lot of warmth and quality of sound. Its sensitive and even response has never let me down and does not change during tours where the instrument might be subjected to extreme humidity variations." "Christoph worked with us for more than 21 years and became one of the world's finest restorers of great instruments, attending to many made by Stradivari himself. It was with mixed feelings that I learned that he was to leave us to make new instruments, but the fine results that he has achieved in ten years or so have fully justified his decision." I have been playing a violin Christoph Götting made in 1999 ever since that time and every day I could fall anew in love with this instrument. I have relied on it in so many concerts, sometimes in greatly varying playing conditions. The evenness of its sound from the lowest to the highest frequencies, its “presence” as well as the possibilities of modulation it gives me during chamber music and in the orchestral terrain are what I cherish. The violin is perfectly made and has a near magical varnish which sparkles, glistens and reveals wonderful reflections. Every day I am fascinated by this and it inspires me. Christoph has without doubt a great insight into the violin making methods of the famous old masters which his long experience in the restoration of the best antique instruments provided. With a respectful look at this past he aims to create new works, but does this without putting on an artificial pretence of age. Christoph tells me that it is his special interest to create instruments with such an easy response and overtone-rich sound that they come very close to the best of the old ones. Over the years I have grown with my violin, (I call it “Pan”), and can only thank him for this creation. 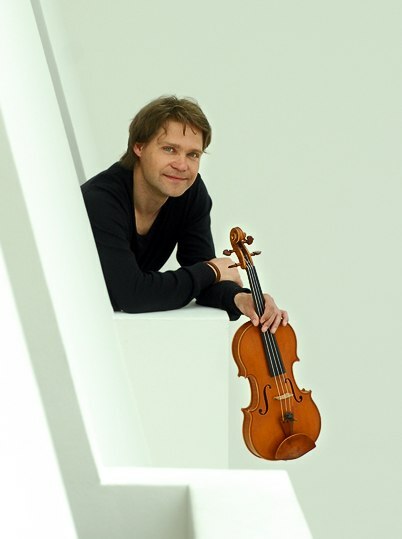 It is a great honour for me to play on Christoph's violin and it has never let me down. The realisation that I have been and still am the first who breathed life into “Pan” excites me. I sometimes wonder who will take it over from me and will make music on it in the future, this is a nice thought. On my website you will find a few pictures and sound clips which present the violin. I am always happy to hear how well it sounds, also in front of the microphone. Thank you so much for this wonderful violin. I've now been playing it for about six months & it keeps getting better & better. It is such an exciting instrument to own & play both as a work of art & as a tool. From the outset the sound has been terrific but almost daily it seems to deepen & become more & more responsive. The upper register is focused,clean,powerful ,sweet & has real carrying properties that are ideal for solo & leading work whilst still having the flexibility for more intimate chamber playing. The lower registers are again powerful & focused with an ever increasing palette of colours to dip into. Visually the violin is stunning,it's deep red varnish seems to almost catch fire under concert platform lighting showing off its dramatic figuring on the back. Already the varnish is bedding down with attractive ware patterns developing just as the great old Italian instruments of the past. I imagine this is how the great classical violins of Cremona & Venice really would have been when they were first made. Thank you again, Peter Nall." Well, your violin is wonderful, I have just played several quartet concerts with it, one of the places was in Friedrichshafen at the Bodensee (where I come from). As musician too, one can enjoy every note of the violin's sound! And with what confidence one can play in these concerts! Thank you! A pupil of mine ordered a concert violin from you when he saw and heard mine, he is perfectly happy with his new acquisition. "I could not afford a Strad, but this Götting has the power and density of sound that I need as a soloist. Most modern fiddles sound hollow, but not these. They are perfectly made and will become more beautiful and more valuable as they age." "I owned one of Christoph's beautiful violins. Playing on a modern violin must be a viable option for a young player nowadays. I was surprised and delighted to find a new instrument that had such complexity of tone, excellent projection and aesthetic beauty. Christoph is clearly at the forefront of contemporary stringed instrument making." "The first thing that strikes one when playing a Götting violin is the sound. These instruments have the beauty, refinement and palette of colours that only belong to the finest violins. Once picked up it is very hard indeed to put them down." "Christoph Götting belongs to violin makers of our time who create their own individual work. The intensity with which he researches and recreates especially Stradivari's craft is not often found. Experiences gained during two decades at Charles Beare's workshop with intimate contact to many "originals" serve as solid foundation for his work." "While visiting Christoph for a regular check-up of my violin, we realized it was the 10th anniversary of my violin. After all those years I am still in love with this beautiful instrument. The warmth of the sound, the palette of colours, the projection, the easiness to play, and not to forget the beautiful varnish are all still there and have even matured and improved over the years. This to me is proof of real craftsmanship! When people ask me what instrument I am playing on, they are amazed to hear that it all (including my Tim Baker bow) has been made only one decade ago…"
"I would like to take this opportunity to tell you that this violin is wonderful. I am very happy with it because it is beautiful and robust yet sensitive and versatile, strong and always refined. Many, many thanks." "Christoph offered a violin to me in 2009 when a customer of his wanted to sell it for financial reasons. He had originally made it in 1992 and its condition, both in sound and looks, was clearly excellent. Very rarely have I come across a modern instrument with sound of such warmth and fine differenciation. It blends miraculously well within small chamber ensembles. I can create a huge range of colours on the instrument and when needed there is a lot of power at my disposal. I can warmly recommend Christoph's violins to anyone." "In my opinion, Christoph Götting is one of Britain's finest violin makers. His tireless efforts in improving the varnish have produced some truly outstanding results and his instruments are a testament to what is possible in contemporary violin making."